Corporate flowers can make a real difference to the look and feel of your office, making a lasting impression on visitors, and boosting staff morale. And the good news is, we can deliver beautiful, professionally arranged flowers for the office, so you don’t have to make a special trip to the florist. Our focus is on making daily office life simpler, easier and better. So whether or not you already have a regular fruit or snack box delivery, we can deliver your beautiful blooms. How handy is that? Please note that this service is currently only available in London and the South East. Ordering your delivery of fresh office flowers is quick and easy, thanks to our partnership with Bloomsbox. Make your choice from our Bold Brights, Perfect Pastels and Classic Whites bouquets or if you prefer, our florist can work with your chosen colour palette – just ask! Choose from Bold Brights, Perfect Pastels and Classic Whites bouquets. Set up deliveries on a recurring basis: weekly, fortnightly, monthly etc. Flexible, no contract process: cancel or suspend deliveries with just 48 hours notice. If you have any questions, please complete our simple enquiry form or call us on 0333 358 3310. Once we understand your specific requirements, we’ll be able to quickly finalise the details and get your office flowers delivered. It goes without saying that a gorgeous bouquet of fresh, fragrant flowers will brighten up any meeting room, or make a reception area more memorable and welcoming. Our office flower delivery service is a simple way to order flowers for your office, so you don’t have the hassle of sourcing or arranging them yourself. We deliver professionally arranged blooms with or without a fruit or snack delivery, courtesy of our partnership with Bloomsbox. 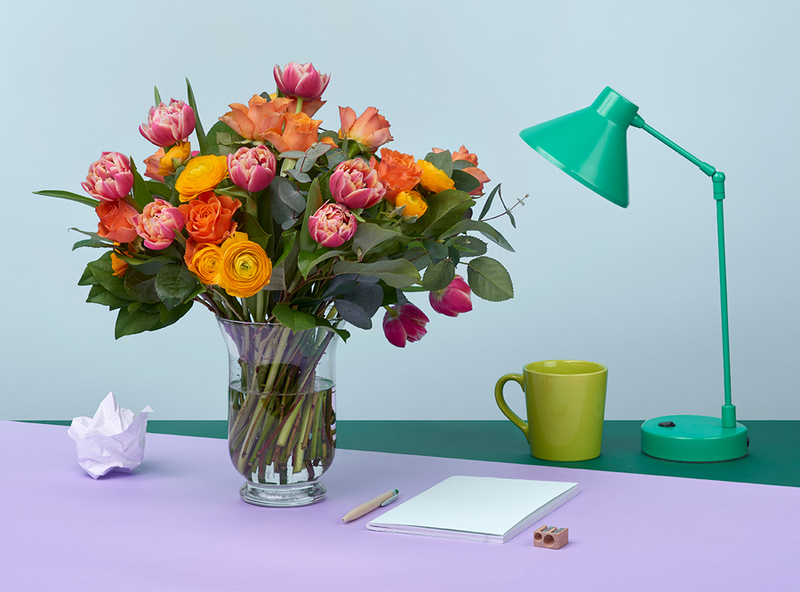 Professional flower arrangements not only enhance office environments with colour and scent – they can have a beneficial effect on how we feel while at work. Research suggests that flowers can have a positive impact on our mood, creativity, and productivity. Now that has to be good! Creating a lower stress work environment is key to productivity, and evidence suggests that flowers can enhance employees’ moods – in other words, they make us feel happier! So by contributing to happiness and lower stress, flowers can also influence our sense of wellbeing, with positive knock-on impacts on employee attendance and motivation. It’s also been claimed that having corporate flowers promotes innovative thinking, new ideas and creative solutions. Whatever your thoughts on the deeper benefits of corporate flowers, if you’d like to have stunning office flowers without the usual hassle of sourcing them, you can be sure we’ll deliver.